Dan and Linda Fritz, with their dog Leo, on the porch of their “Old Book House” Friday. The news on Albany’s Front Avenue is that the “Old Book House” has new owners and the book itself has gone home to the place where it was lost and hidden in a wall for around 80 years. 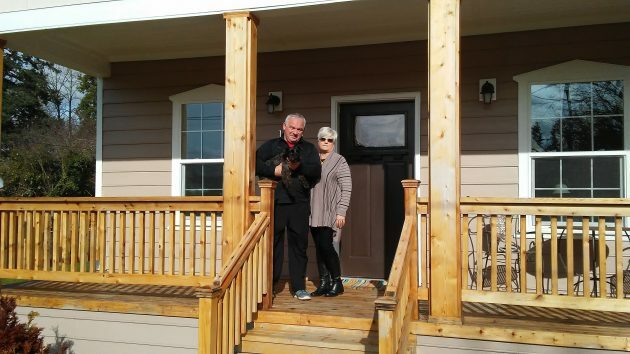 Dan and Linda Fritz have bought the rebuilt and enlarged house at 1405 Front Ave. N.E. from Sean Sullivan of Superior Carpentry and Homebuilding. Sullivan acquired the rundown property in 2015 and spent most of 2016 resurrecting it as a comfortable home that combines the look of tradition with elegant features and modern conveniences. Early in the demolition of the interior, one of the walls gave up the “old book,” a 1907 edition of “American Railway Transportation.” It had been checked out of the Albany Public Library in the 1930s and then, apparently, fallen down the inside of the wall from upstairs. The discovery of the book provided me with an angle for several stories as I watched progress on the rescue of this house, more than a century old. Sullivan returned the book to the library, where nobody even tried to collect the whopping overdue fine (one cent a day at the time it went missing.) The library no longer needed the book and gave it to me. Sullivan and I then agreed to return it to whoever bought the house when it was done. Well, it was done in December. Dan and Linda Fritz bought it the following month, and on Friday I had the pleasure of meeting the new owners and taking the railroad book home. 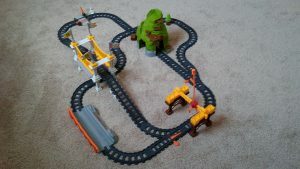 Track is all set up for visiting grandson. The library card still lodged inside — and my checking on the name on the card — suggested that the book had last been checked out by someone with the Southern Pacific. And as it happens, a hint of the railroading tradition lives on in the house. In an extra bedroom upstairs, a toy train set is ready for the owners’ 2-year-old grandson when he comes to visit. The Fritzes moved to the Albany area about four years ago from Eugene. He’s in his first year as principal of Jefferson Middle School, having moved over from being vice principal at Jefferson High. Linda’s career has been in health care administration, and she works as staffing coordinator at Samaritan Albany General Hospital. It was obvious to me that they love the house. Linda told me they plan to adopt the name I gave the place in my stories, Old Book House, and attach a plaque to that effect by the front door. 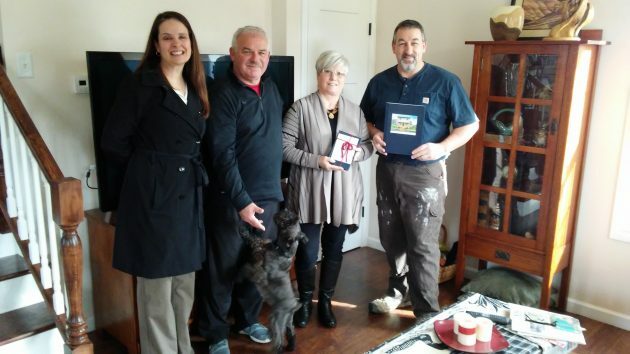 From left: Real estate broker Amy Price, Dan and Linda Fritz, with Leo wanting attention, and builder Sean Sullivan. Mrs. Fritz is holding the railroading book. Thank you so much for seeing this story all the way to end. I’ve enjoyed reading all of the installments and it is nice to read “the rest of the story” as Paul Harvey used to say. A wonderful story – all the way through. Thank you for the diligence Hasso! Thanks Hasso. Stories of renewal in the Hackelman district warm my heart.